While India is a treasure trove of art and handicrafts, it seems hardly reflected in our retail designs. But Tata Group’s saree retailing venture Taneira, little over a year into existence, takes a refreshingly different route with a store design ID that celebrates India’s rich artistic heritage. While the whole store is an abundant celebration of Indian-ness, VMRD picks up a few most noteworthy elements. Cyanotype printing: The stairway to each floor is adorned with printed fabrics that are delicate and subtle and take you along on an aesthetic journey. Made using cyanotype printing, these subtle fabrics reflect various flora, delicately made by artists in Shahpurjat, a small art village within the city of Delhi. Wax pods: These cotton pods are made using a wax mould, which is placed in mud. Hot brass is poured into this mould. The brass then takes the shape of the pods to create these beautiful ‘Wabi Sabi (a Japanese word meaning ‘beauty in imperfection’ pods. Celebrating the touch of hand, these pods make their journey from Pondicherry, handmade by craftsman Saravanan. Silver art: The vertically placed silver art installations at the entrance depict the roots of the 'Tree of Life'. This distinct depiction placed in the motifs, patterns and designs of the sarees take their inspiration from the 'roots' of beliefs. Recycled wooden elements: The recycled wooden ceiling bears stylish lotus flowers, painstakingly hand hammered and connoting everything auspicious. The lotus flower is also one of the oldest motifs in the world of sarees. Reclaimed wood: Capturing a bit of vintage spirit are these antique cane chairs, a craft that was once a part of many Indian households but is rarely found today. The table legs as well as the wooden pillars in the store are reclaimed pieces from old Chettinad houses. Mother of Pearl inlay: Old wood nesting tables are engraved with mother of pearl inlay - a hint of subtle glamour to compliment rich silks that adorn our shelves. Makrana marble windows: A glimpse into Kanjeevaram and other southern silk sarees stocked in the next floor is a treat for the eye with sunlight filtering and lighting up the displays through these vast panels of Makrana marble. Making its way journey from Rajasthan, Makrana marble is what exemplifies the beauty of the Taj Mahal and is hence an iconic symbol of India’s artistic heritage. “What you see in our first flagship at South Extension Market in Delhi, spread across 7000 sq ft, is a consolidated and detailed representation of how exactly we want Taneira store’s design ID to be. Going forward, we will take inspiration from this gigantic displays and may take one or two elements and amplify them in our upcoming stores. For example, the immediate next store at Ambience Mall, Vasant Kunj, takes inspiration from water bodies and works around them. Similarly, the future stores will explain on one or two elements from the original ID. 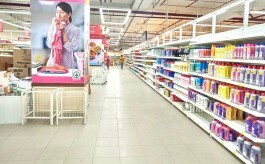 Though the initial stores have been made through a lot of sourcing and inventing, we will soon standardize our fixtures, lighting etc., with regular vendors. It’s a myth that environmentally-conscious practices or working closely with artisans and craftsmen make the process lengthy. There processes can easily be fallen under a system and standardizations. 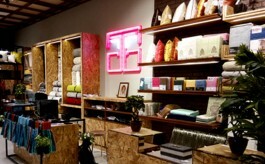 Taneira stores are wonderful examples of how raw art can be integrated into functional design. 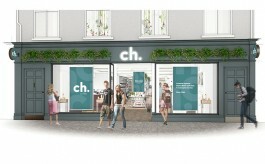 While 70% elements of future stores will be standardized, we will leave 30% to local flavor.